Ergonomic seating and lower entry/exit designed suits the entire family, even grandma. High tech foam padded seats make the journey seem shorter. Cleverly split storage keeps things in their place. A platform above the rear storage well keeps your groceries from disappearing into a black hole. Visibility is great with huge rearview mirrors, convo mirrors, back up cam and blind spot warning systems. Dual sun/moon roofs and a high ceiling give a spacious, light and bright feeling even in the third row. The entertainment system rocks with one of the largest single screens out there. Intuitive, well thought out dash puts everything in your field of touch. Powerful V6 delivers 253 hp & super smooth ride for total control and security while driving. CUV/SUV-like styling makes you feel less like a minivan mom. The Quest doesn’t fare as well as some of the other minivans on the market in the mileage game – it rated 18 city/24 hwy. This mileage is still better than many SUV’s however. 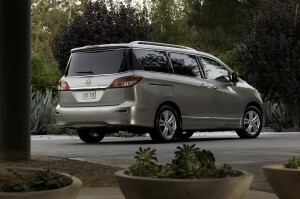 This vehicle is lot more comfortable/practical for a family on the go than most SUVs. Pricing starts at $27,500 and maxes out at $41,500 for the top of the line loaded model. Thanks to Caryn Bailey of Rockin’ Mama & Elizabeth Peterson of Traded My BMW for a Minivan for impersonating my children and Ellen Seidman of Love that Max for being such an awesome test drive co-pilot! Disclosure: Nissan kindly provided hotel accomodations & meals during the test drive experience. There was also a 25 minute pre-drive massage. I wish my current minivan came with that feature. It would make me look forward to the carpool, so much more. All opinions my own, as always. Wow, I am very interested in this! I am driving a 2001 Sienna and thought I was ready to get rid of the minivan, but now I’m wanting to see this new Quest. Very fun video, too, by the way! Love it.